Home » FAQ Archive -- But, also note the subcategories in the orange navigation, above! 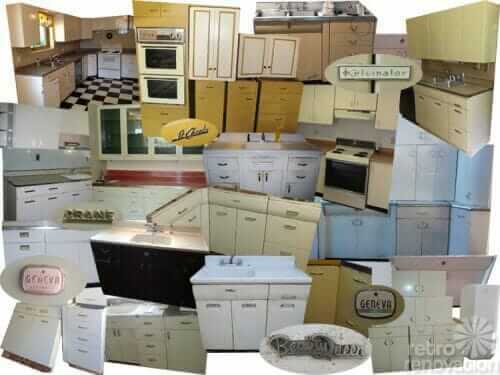 » Kitchens FAQs » How much are my metal kitchen cabinets worth? WHAT IS THE VALUE of a set of vintage steel kitchen cabinets? What price should you ask? This is one of the top questions that I receive on the blog. The answer is not definitive — but there are a number of factors to consider, including: Condition, Size of Set, Brand, and Location. Read on for more, plus some pricing guidelines. And also see my post on how and where to sell your cabinets. Augest 2016 UPDATE: This story was written in 2010. Prices HAVE gone up, as more people are now looking for these cabinets. That said, this is still a tricky market because of the hassles involved in making an old kitchen work for a new space and because professional refinishing is often required. 1. Condition — The number-one determinant of value, I’d say, is condition. If the cabinets are are in excellent shape — with their original finish — and don’t need repainting, that will add to their value. Repainting cabinets can get expensive and is a hassle. Rust on the sink cabinet also is not good. And a serious ding will pretty much bring a cabinet’s value to zero. My advice to buyers is: Hold out for cabinets in excellent condition, they are out there. 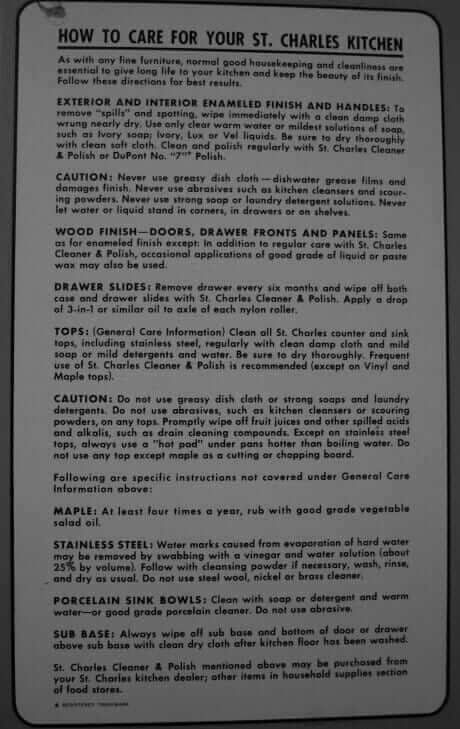 AND REMEMBER: Old products and materials can contain hazards, such as lead paint. Get with your own properly licensed professional to assess what you are dealing with so that you can make informed decisions how to handle. 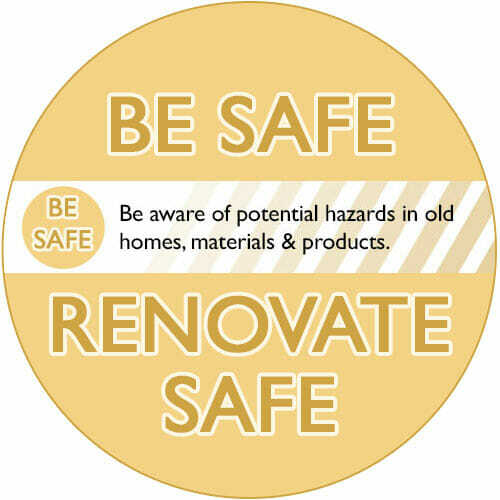 For more links and info see our Be Safe/Renovate Safe page . 2. Number of pieces available…size of your set — It can also be quite a hassle to retrofit someone else’s kitchen into your kitchen space. I bought 67 cabinets to get the right fit into my 15’x15′ space. And I made it work by the skin of my teeth. I know several readers who are in the process of collecting 2 or more sets just to get the right pieces. So in general I’d say that the larger your set, the better luck you will have finding a buyer. 3. Brand — I tend to believe that the larger-name brands are going to find a home sooner because of the issue above, that is, people collecting multiple sets. From my research I’d say that the big name brands were and are: Youngstown, Geneva, St. Charles. There are some folks who say that St. Charles was the cream of the crop…but I have 1963 Geneva’s and I think their quality is terrific. If you have a less-common brand — like Crosley, Tracy, American brand — you still may find a buyer, especially if there is a collector watching far and wide to find just the cabinets they like. 4. Location — I tend to believe that the market for cabinets is very local or tight regionally. Buyers are most likely going to want to come pick up the cabinets personally as shipping is costly. They also are likely to want to see them. So, the closer you are to a large city the better you chances may be of finding a buyer close enough to work with. The last factor is: How much time do you have? If you need your cabinets out of the garage next week… well, don’t be thinking you’ll get the top possible dollar. While interest in these cabinets is growing, it’s still a collector’s market. If you plan for some time to connect with the right buyer you may get a better price. Okay. All that said, how much? Early on in the forum’s life, a large set of cabinets (sorry, I forget the brand) in a great shape, from a church kitchen in Iowa, sold for $5,000. At that time, that was the most I ever heard a set sell for. I bought my 67 cabinets — 100+ linear feet in great shape, original finish, great color – for $3,000 in 2005. The reason I got them so cheap (in my estimation) is that the seller would not break up the set, and she was in the heart of Gotham. Also, 2005 was ‘early days’ before these cabinets became as collectible as they are today. And just so you have an idea of what a buyer might have to go through: I took a day off work and paid my hauler to go with me to NYC to check out the cabinets and viability of moving them, BEFORE I made my decision. I then had to pay another $3,000 to the hauling company for the cabinets’ Escape from New York. Then for 4 months, I had to rent a Pod to house them in my front yard while the kitchen renovation got under way. During this entire time, I also had to endure my husband’s beady-eyed stare, he did not believe the grungy cabinets would be worth the effort. (Fortunately, all the NYC grime protected their finish, they are gorgeous and all is well here in Pam’s Retro Paradise once again.) After I installed all I could (in mudroom and garage, too), I sold the remaining 28 cabinets (pictured above) for $2,500 minus commissions to ebay and paypal. One bidder, at the last second. So that’s the saga of one buyer. Honestly, the seller in NYC probably should have paid me to take them off her hands – I am sure she would have had to pay some dough-re-mi to cart them off to a dump. But it was a non-profit… I didn’t even dicker. A really beautiful, large set of St. Charles’ sold out of a Detroit-area home for $2,000. I think the buyer (a reader) got some nice vintage appliances, too. Had to drive 3 hours. Smaller sets… in bad condition: Less. Why don’t the cabinets sell for more? They are expensive to repaint. They are a hassle to hunt down, pick up, store and then try to retrofit into an existing kitchen. To that right person it can be very gratifying, but Retro Renovation takes a lot of energy physically and creatively – it’s hard work and time consuming. If these are in terrific shape — if the drainboard sink is in pristine condition — they can be worth…$250 or more on the open market? If you have a name brand – especially a Youngstown, I think — you may have good chances of finding a buyer looking for this important piece. Places like historichouseparts.com sell them for more, but remember they are dealers so have underlying fixed costs. We have a Youngstown sink unit with double drain boards. Finish is not original but in ok shape, box is pretty rusty and one drawer doesn’t open. I’d love to reuse the sink top in a kitchen remodel. Any resources for how to clean it up properly, and/or ideas for how to incorporate it into new cabinets? Comments now closed — as they were getting redundant.